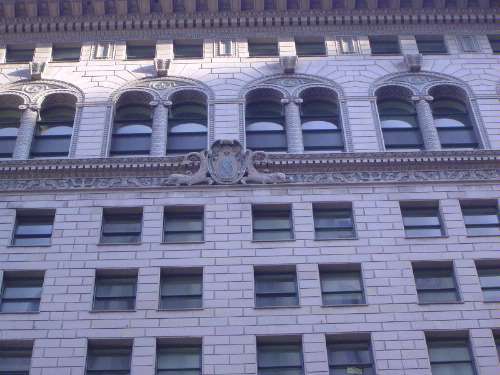 What the boy was most oblivious to was San Francisco's importance as an economic center. He saw the downtown buildings but made no connection between them and the power they symbolized. Pity the over-wise child who does. 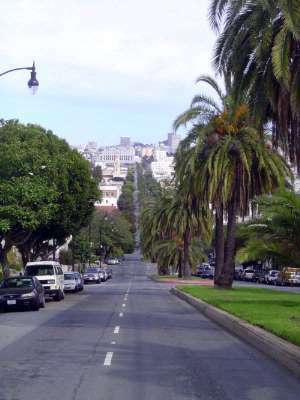 The boy's sense of history reached back to what was to him prehistory, the period of San Francisco's Mission Dolores, discernible in the distance here on the distinctively palm-lined Dolores Street. Not many streets in the city have palms, and the boy never wondered why this one did. 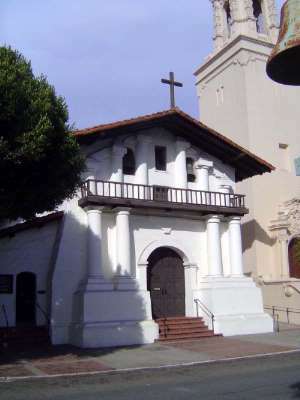 They're not especially old--nowhere near as old as the mission. 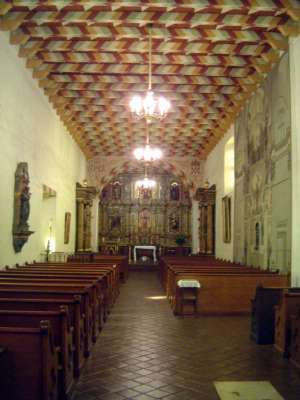 The mission itself he recognized but found not only uninteresting but somehow repellent. It was old. Ugh! If he ever went inside, he retained no memory of it. 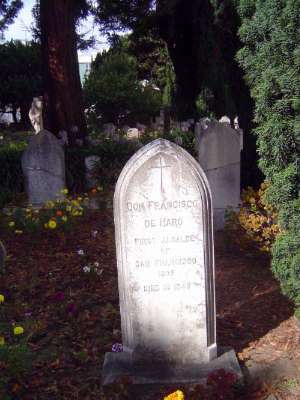 Nor of the mission's cemetery, including the grave of the city's first mayor. 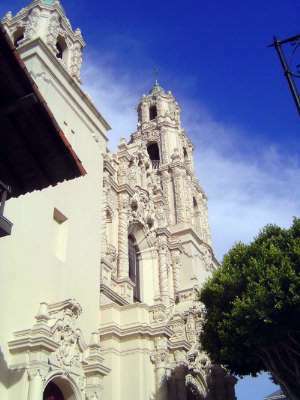 The adjoining baroque construction he utterly ignored, as if it had no story of its own. 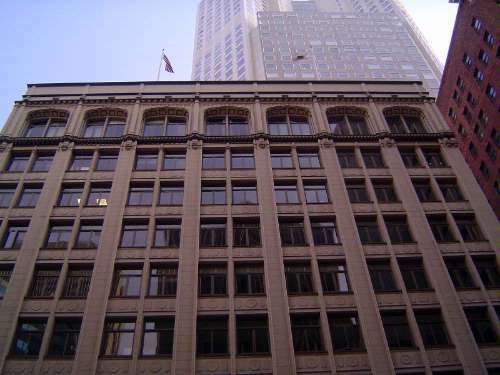 He had heard of the Russ Building, for a while the city's tallest. He never paid it any attention. Perhaps he had company: the empty niches suggest that even the building's owners didn't care much about much more than collecting their rent. 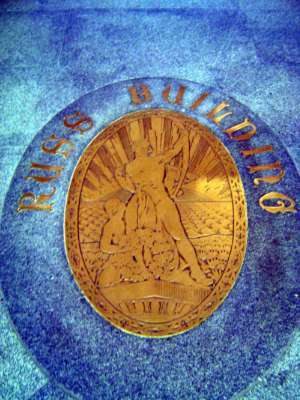 What myth was embodied in this floor medallion at the building's main entrance? 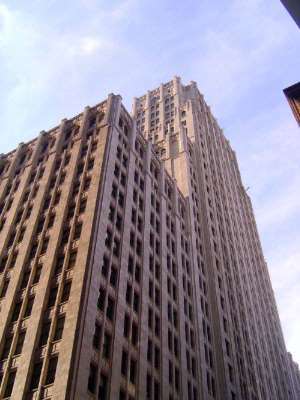 Finished two years earlier, in 1925, this building was briefly the city's tallest. 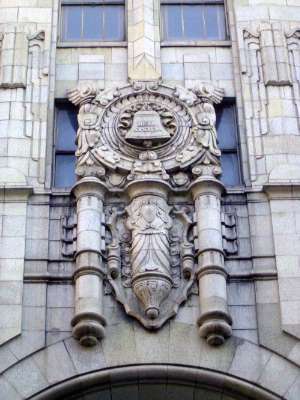 It was the home of Pacific Bell, whose network reached to the boy's home but whose clout he never considered. Did the company have a history? He never asked. Up top there were eagles, but coming across the Bay Bridge you couldn't distinguish anything except the building's height. 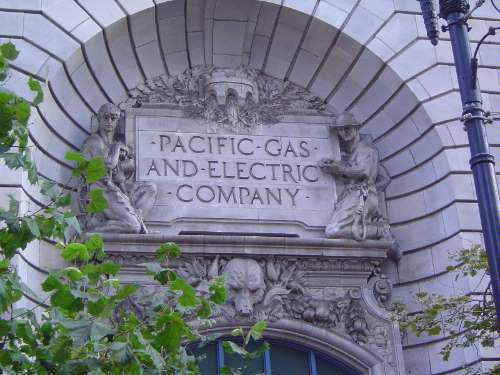 The boy knew that the city got its electricity from PG&E, but he had no idea of the company's long involvement developing hydropower in the Sierra Nevada, which inspired at least the grizzly bear over the entrance at the company headquarters. This building he did recognize, mainly because for many years its roof carried a smashingly simple but huge sign, no doubt the most visible bit of corporate advertising seen by anyone crossing the bay. In blue and white, it read only "SP." 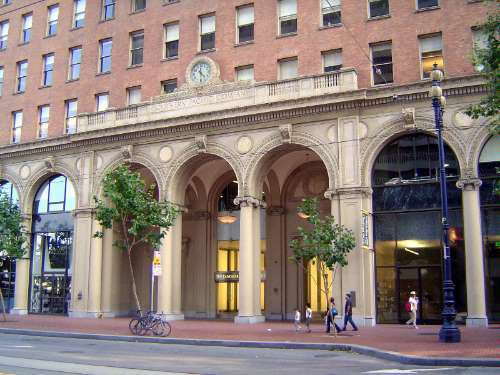 The building, at 65 Market Street, was sometimes called the Vatican of western railroading. 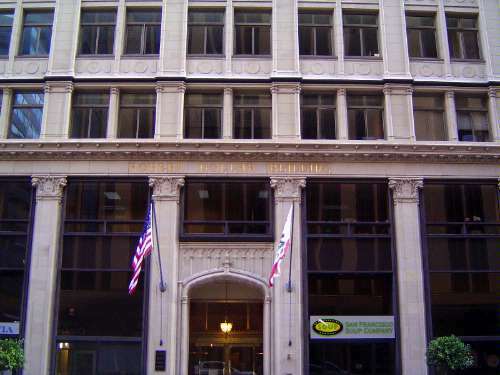 Hard to believe that the company was eventually engulfed by the Union Pacific, although, come to think of it, a hundred years earlier it was temporarily brought into the same combination at the hands of Edward Harriman. Next door was this building, which the boy never paid any attention to. 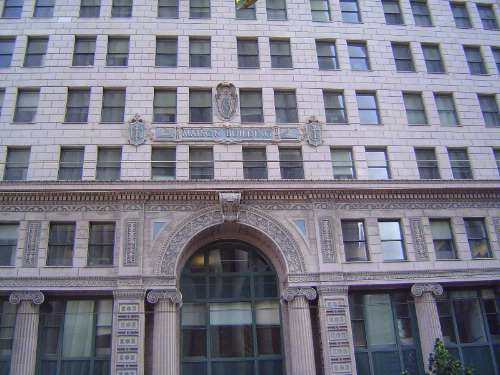 Now he walks by and is struck by the fact that this was the headquarters of one of the most important shipping lines operating across the Pacific, a line that when he was a boy ran the famous, or at least much advertised, Lurline, a passenger liner running to Hawaii even in the 1950s. 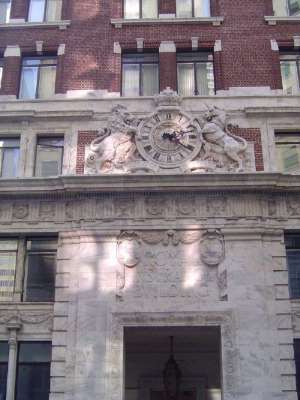 Completed in 1921, this building was the company's headquarters until 1947. 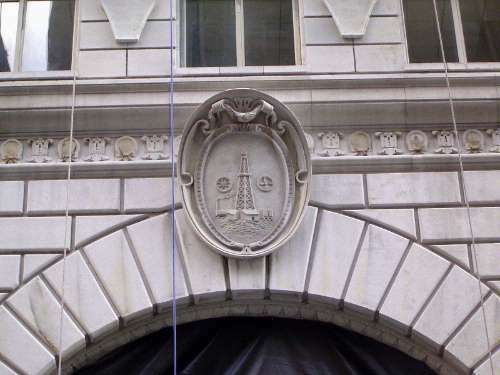 A detail, with squid bracing the anchor logo. 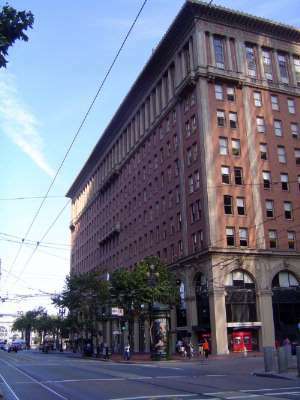 Matson's competition came in part from the Robert Dollar line, whose headquarters, from 1919, is the oldest of any building seen so far in this group. Dollar had a long career, extending to providing the Oregon logs used to rebuild Beijing's famous Temple of Heaven. 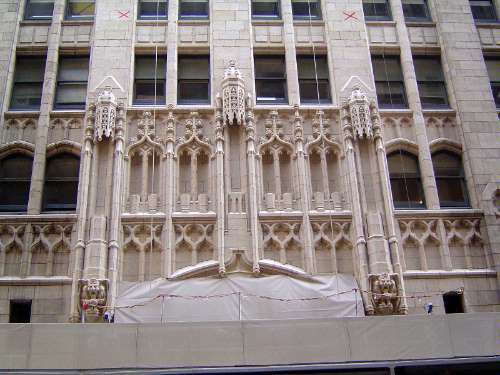 The building has lost its cornice. 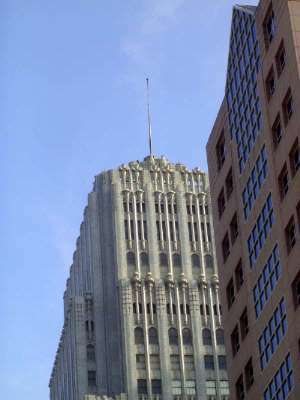 Another corporate giant: the headquarters from 1922 of Standard Oil of California, one of the major fragments of the Rockefeller empire. Massive redwood derricks like this were soon to be replaced by steel ones. 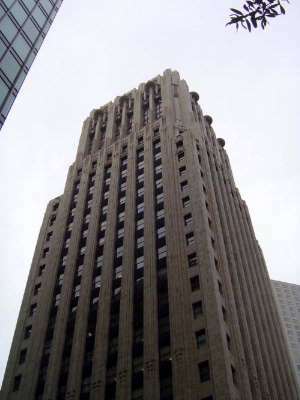 The 1929 tower of perhaps the Standard's most venerable competitor--and a company with a long history not only marketing products in California but producing from the pioneer oilfields of the San Joaquin Valley. 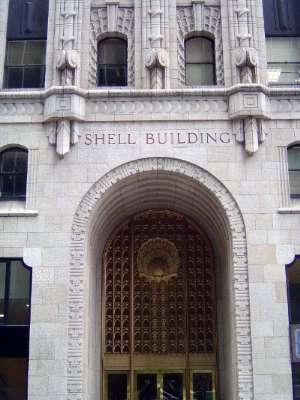 The top of the Shell Building. 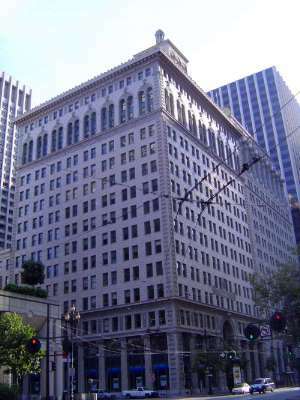 The Royal was locally famous because, unlike other insurance companies, it paid claims for losses incurred during the 1906 quake. The boy never noticed the building.